Advisor "Orders Assistant" is designed to control the positions and orders that are opened manually by the trader. The control is performed by automatically placing TakeProfit and StopLoss orders after the position is opened by the trader, or setting a pending order and further tracking the position using the services “Transfer StopLoss to breakeven” and “Trailing Stop”. The Expert Advisor also provides the ability to install virtual TakeProfit and StopLoss, which allows you to use scalping strategies, bypassing the restrictions on the CloseProfit and StopLoss installations that are closest to the market. The Expert Advisor monitors all open positions by the method in the terminal, except for positions opened by robots (identification is performed on the principle of checking the Magic Number, for its difference from 0). In other words, all points in the terminal for the instrument installed by the adviser, and which have a magic number = 0, will be monitored by the advisor. The adviser displays its actions in the general log or keeps a separate log file. Stop_Loss - Stop Loss value in points. Take_Profit - TakeProfit value in points. Virtual_Stop_Loss - value of virtual Stop Loss in points. Virtual_Take_Profit - value of virtual takeProfit in points. Stop_Loss_To_Zero_Profit - enable (true) or disable (false) expert advisor functions - transfer Stop Loss to break-even level. 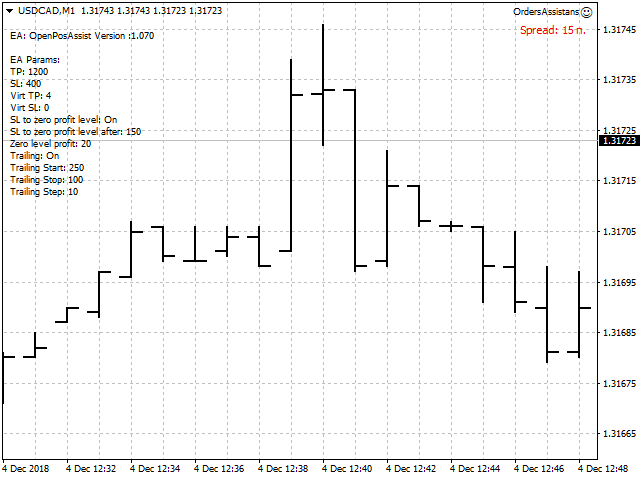 Stop_Loss_To_Zero_After - the value in points, when the adviser moves StopLoss to breakeven. 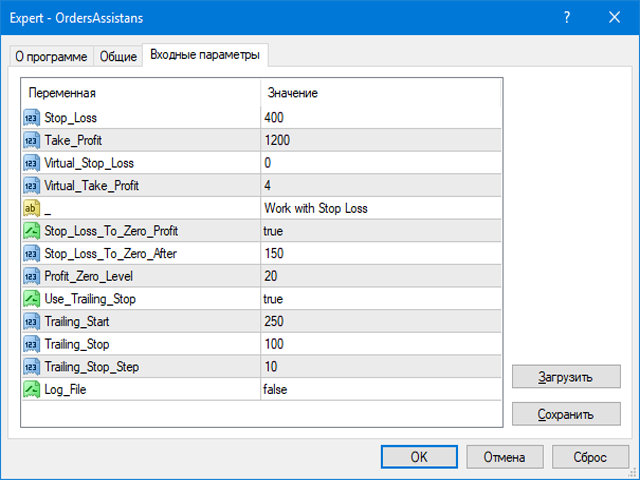 If the value of the parameter is less than the allowed level of the Stop Loss system, the adviser will set the value of the user automatically. Profit_Zero_Level - profit level to which Stop Loss will be transferred when performing the Stop Loss procedure to breakeven. Use_Trailing_Stop - enable (true) or disable (false) advisor functions - Trailing Stop. Trailing_Start - the value in points, at which the adviser will trailing the Stop Loss. Trailing_Stop - value in points, from the current price to the Stop Loss, after the Stop Loss transfer during the trailing procedure. Trailing_Stop_Step - profit in points, during the passage, where the adviser will take the Stop Loss to a new level during the trailing procedure. Log_File - enable (true) or disable (false) the recording of advisor operations in a separate log file.